Having friends over this weekend? Hosting an all-girls affair? Just staying in and playing cozy all by your lonesome self? All three are excellent options if you ask me. 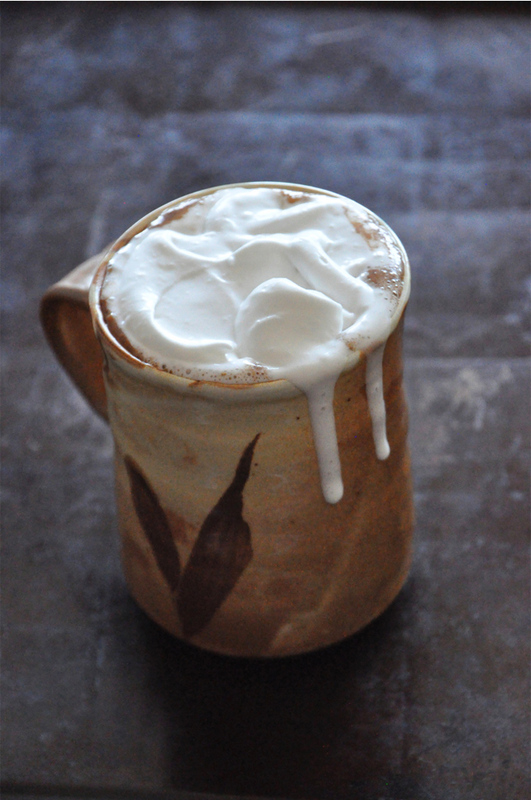 But in any case I have just the thing: Vegan Mexican Hot Chocolate with sweet cinnamon, earthy nutmeg, spicy nutmeg cayenne and a dollop of creamy coconut whipped cream. 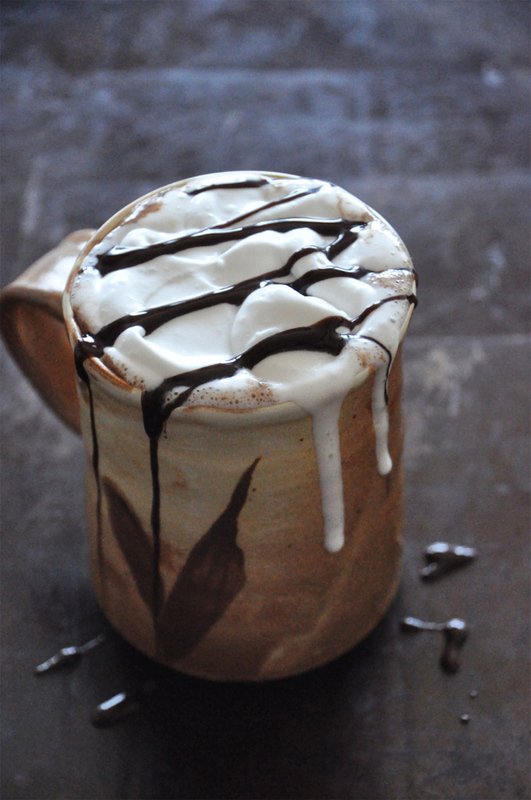 As you know from my Boozy Pumpkin White Hot Chocolate story, I love hot chocolate. Its hot, sweet and chocolate-y goodness never does me wrong. But since I’m a part-time vegan and lover of all things coconut and spice, I decided to give an alternative recipe a try. The base of this beverage is simple: Non-dairy milk (I mixed full-fat coconut milk and vanilla almond milk), cocoa powder, vanilla extract, salt, sugar, and pinches of Vietnamese cinnamon, nutmeg, and extra-hot cayenne. Then for a luxurious finish I add a layer of vanilla-infused coconut “whipped cream” made with my remaining coconut milk and drizzle it on top with a little chocolate syrup for good measure. If my hot cocoa-loving neighbors wouldn’t have been nearby for sampling, I would’ve guzzled the whole batch down by myself. 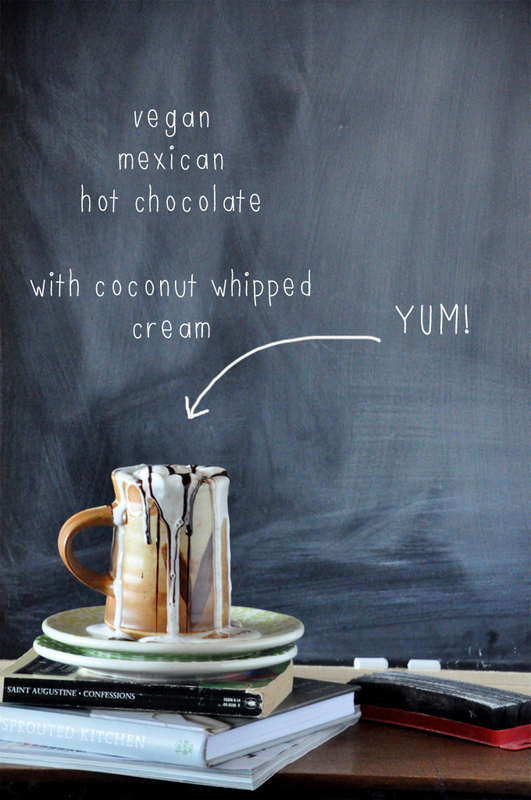 Sweet and slightly spiced Mexican Hot Chocolate with cool, creamy coconut whipped cream. In a small saucepan, bring milk to a low simmer over medium heat. Add cocoa powder, sugar, salt, vanilla and spices and whisk vigorously to combine. 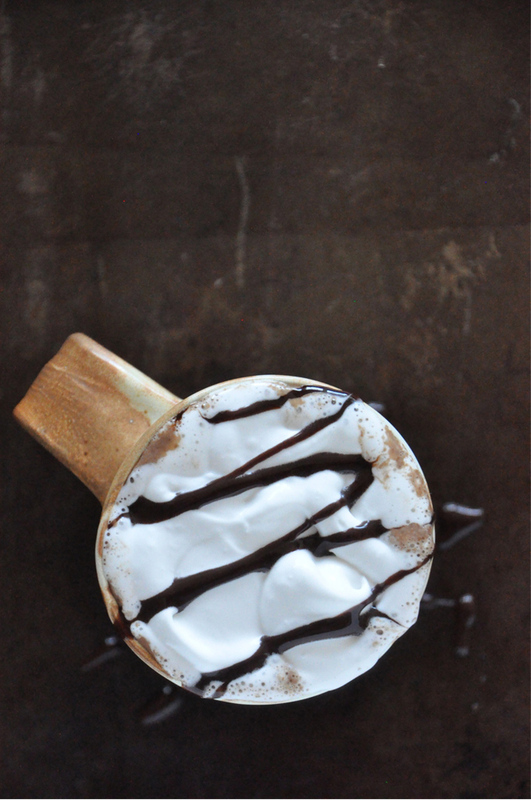 Serve warm with coconut (or regular) whipped cream and a drizzle of chocolate syrup. 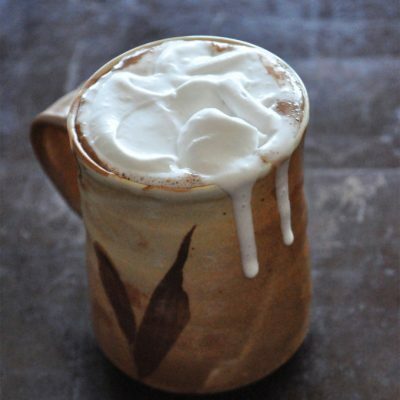 A vegan alternative to traditional whipped cream. Place your coconut milk in the fridge overnight or in the freezer for 30 minutes to an hour. Upon removal, be careful NOT to shake the can as you want the cream to remain separated from the liquid. Add powdered sugar and vanilla and whip again to combine. Taste and adjust flavor/sweetness accordingly. Serve with hot cocoa and reserve the rest in an airtight container in the fridge for later use. Should keep for several days. P.S. The mug featured in this post was handcrafted by our local artist and friend Troy Becker. Great recipe, very popular in my house. I used oat milk, which I find sweet, so I added less sugar. Really enjoyed, thank you! mmm I love this whipped cream!!!!!!!!!!!! I made it with a pineapple cake which was decadent. I love making these kinds of drinks, especially in the fall on a chilly night. I have been blending up fresh fruit smoothies every morning which are wonderful, and I’m learning a lot from my cooking class too. Is there a specific brand of coconut milk you use to make the whipped cream? I tried over the weekend using Whole Food’s brand 365 and it didn’t whip up very well. Would love a suggestion, thanks :) PS. I love your blog and it has changed my life, quite seriously. Ah, thanks Meghan! SO kind. I think Whole Foods is great, so give it another try. And be sure to refrigerate overnight and leave the liquid behind. Otherwise, the Trader Joe’s coconut cream is THE best. Native Foods is also pretty good. Looks great. What the hell is a part-time vegan though? Are you only bothered by animals’ enslavement, murder and torture 3 days a week or something? I just made this. It took about 15 minutes for both the hot chocolate and whipped topping. So simple, and such basic ingredients – I even had the coconut milk on hand. 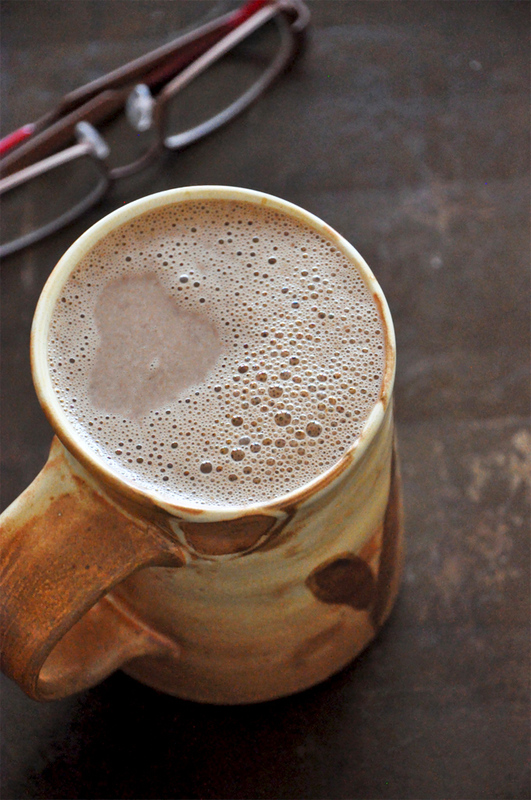 The hot chocolate alone has a thick, rich, creamy, wonderful mouth-feel. The whipped coconut cream puts it over the top, in a very good way. The amount of cayenne was just right for me, but I’m a Texan. Others might want to use half the amount and then add more to taste, especially if serving it to kids. I recommend a light sprinkle of cinnamon on top of the whipped cream, with or without the chocolate syrup drizzle. Thank you for this wonderful winter (vegan) treat!!!!!! I am drooling all over my keyboard and it’s entirely your fault. 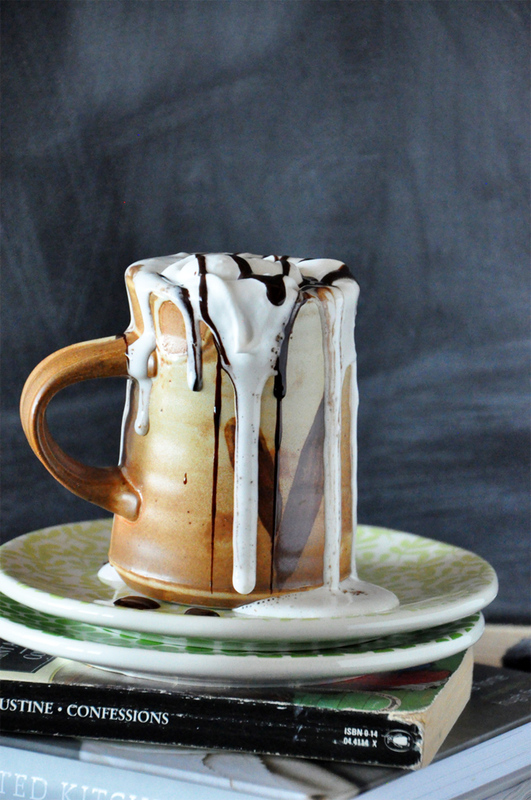 What a tempting mug of hot cocoa! 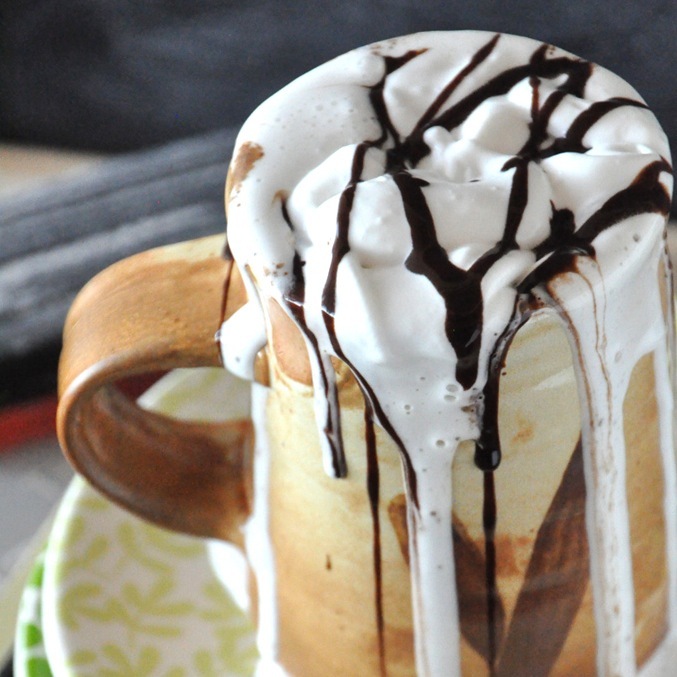 Thanks for sharing a fun hot cocoa twist. Pinned to my “Healthy Holidays” board. This is awesome! I have never liked coconut, but this recipe is delicious :) Thanks a lot. Oh my goodness…What a beautiful blog and amazing photos! Love trying your recipes and getting your emails! Thanks Heather! SO glad you found us. Your sweet words made my day. The recipe sounds intriguing but the pictures…..well, while I suppose they are artsy the munchkins in my care are hesitant. They have the impression this will be sticky and messy, things they don’t like. Just don’t overfill the cup like I did (strictly for photos) and your kiddos will love this drink! Love this. I love that it flows over! Since you posted this, I have made it more times than I’d like to admit. It is delicious and so think and creamy! This looks so fabulous! I love the addition of vegan whipped cream :) I’m sure the pinch of cayenne makes it over the top delish! I want to swim in that. Just made this without the whipped cream and with dairy milk and OMG so amazing. Thank you so much for sharing! Chocolate and coconut are the two key words that get me to perk my ears up, and this one definitely did the trick. I don’t have any coconut milk, but I have coconut cream which is actually thicker so I have a feeling it might do the trick. I’m so excited to try it! what whaaaaat lets be friends, you make magic. 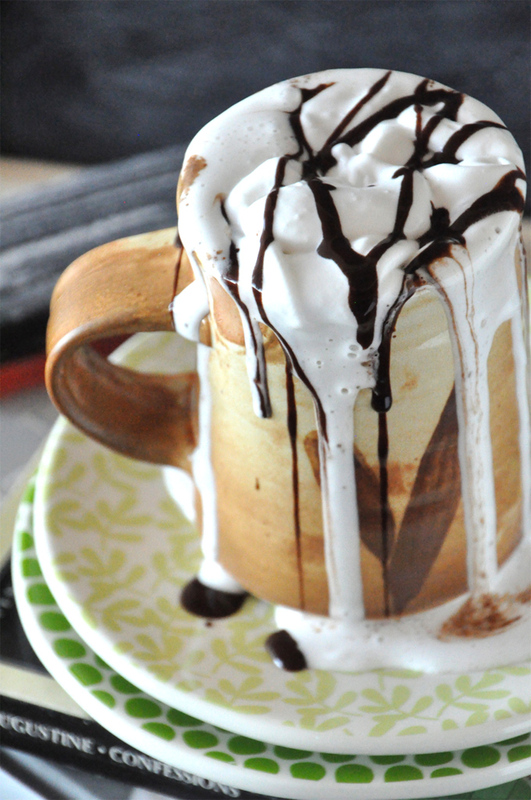 I am trying this hot chocolate now ! Smells so good! I also love your MacKenzie-esque mug!! Yes! I linked to it at the bottom of the page! Your pictures are lovely, I am dying for a hot chocolate now. Would love for you to share your pictures with us at foodepix.com. love the pics and recipe. must b delicious and wonderful idea to beat d autumn blues..
Yum, this looks just beautiful.